The Cold War and the ever-present threat of Atomic War may have been a dominant theme during the post-WWII era, but just as pervasive was a fear of Communist infiltration into our institutions which were designed to weaken us economically, militarily, and morally. These fears were far from being without merit. The United States and the Soviet Union had been uneasy allies during the War, and after the conflict, they were the only great powers with sufficient economic and military might to be leaders in the community of nations. The Comintern or Communist International Congress of Nations sponsored by the Soviet Union had a published goal of overthrowing the "international bourgeoisie" and for the creation of an international Soviet republic. The Communist Party of the United States of America (CPUSA) was a legitimate and legal political entity, formed in 1919, just two years after the Communists overthrew the Russian Tsar. Several of the agitators and organizers of the American Labor Movement in the first half of the Twentieth Century were closely associated with, if not members of CPUSA. It was an open secret that CPUSA received funding and instructions from the Soviet Union, and although they were a legitimate party, not all of their activities were strictly legal. Many of the Party's criminal activities were profiled in the ZIV Syndicated program I Was a Communist for the FBI. 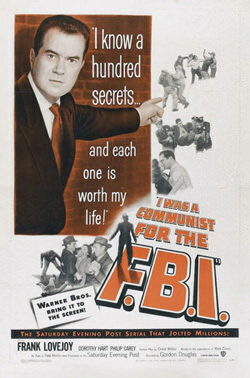 The concept for IWAC was based on the story of Matt Cvetic, an operative for the Federal Bureau of Investigation who infiltrated a Communist cell for nine years. Eventually, Cvetic became a valuable witness for the House UnAmerican Activities Committee of the US House of Representatives. The HUAC was created in 1938 to investigate disloyal and subversive activities of government employees, organizations, and private citizens. The Committee had a very definite function in relation to National Security during time of War, it may have overstepped its mandate in the post-War era. The HUAC considered investigating the Ku Klux Klan in 1946 but chose instead to focus possible Communist infiltration of the Works Progress Administration and other New Deal programs. One of HUAC's most notorious accomplishments was the establishment of the Hollywood Blacklist. The Blacklist began when a group of movie writers and directors known as the Hollywood Ten were called to testify before HUAC. Most members of the Ten had, in fact, had an earlier association with Communist sympathizers, but there was no definitive evidence of wrong-doing. The Ten were cited for contempt of Congress for refusing to cooperate with the committee in 1947, and although there was no conviction all ten were fired by their respective studios. 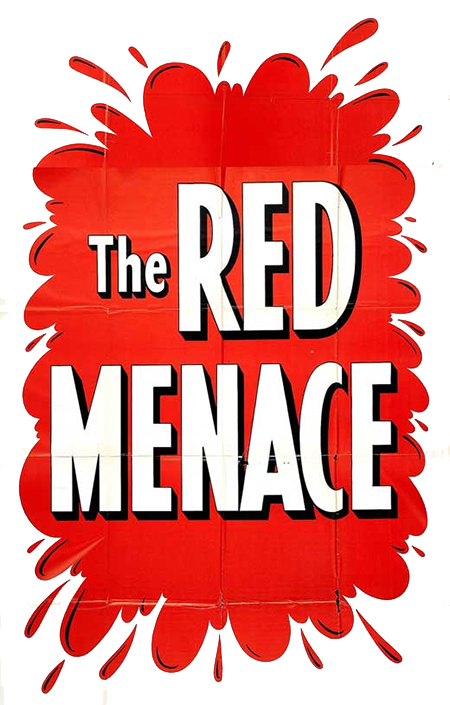 In 1950, a pamphlet titled Red Channels began to circulate with names of other Hollywood figures with alleged Communist ties. Being named in Red Channels usually led to a subpoena from the Committee, and refusal to cooperate would lead to Blacklisting. HUAC actually enjoyed considerable support in Hollywood. 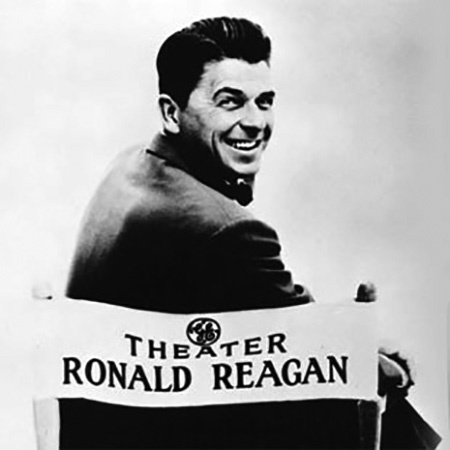 The studio heads, notably Walt Disney, were anxious to rid the movie industry of any Communist influence (although their fears were more of labor troubles than political), and actor Ronald Reagan, then president of the Screen Actors Guild, was a noted anti-Communist. 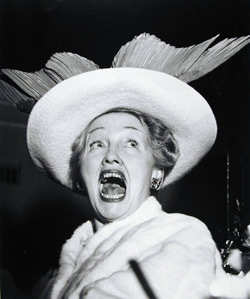 Gossip columnist Hedda Hopper used her program to denounce supposed Commies in the acting community. 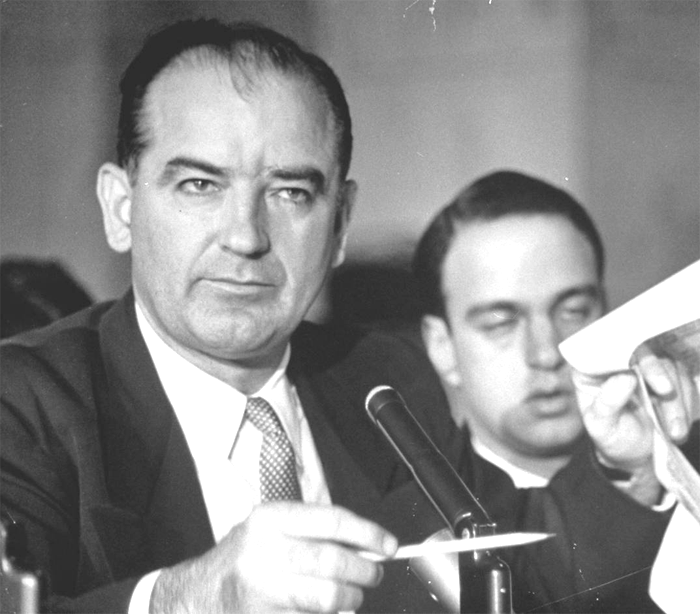 Although not an actual member of HUAC, Senator Joseph McCarthy became the face of the so-called Communist Witch Hunt. McCarthy was elected to the Senate in1947 after taking advantage of what was later discovered to be an inflated and falsified War record. The Senator from Wisconsin remained in relative obscurity until February 1950 when he made a speech where he claimed to have a list of names of members of members of CPUSA in the employ of the State Department who constituted a Soviet spy ring. The notoriety that came with making the accusations seemed to inflate "Tail-Gunner Joe's" ego, and he made further accusations of Communist infiltration of the State Department, President Truman's administration, the Voice of American radio service, and the US Army. When McCarthy's Senate committee began investigating supposed Communists in the Army Signal Corps at Ft Monmouth, the hearings received "gavel to gavel" television coverage. The coverage included misbehavior by both the Senator and his staff and eventually led to McCarthy's political downfall. 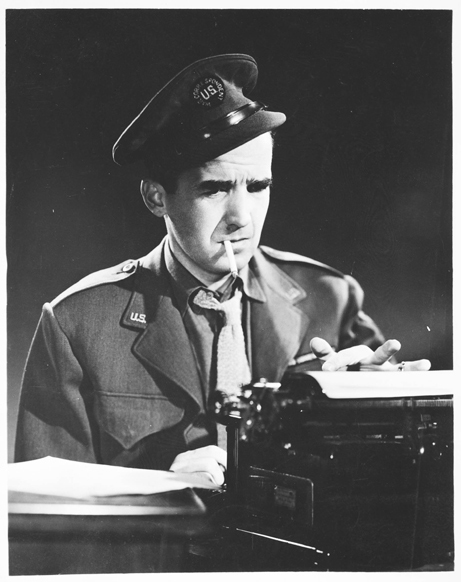 The nail in the Senator's political coffin came in the form of a series of reports by CBS journalist Edward R. Murrow. McCarthy was eventually censured by the Senate and died at Bethesda Naval Hospital in May 1957 at the age of 48. 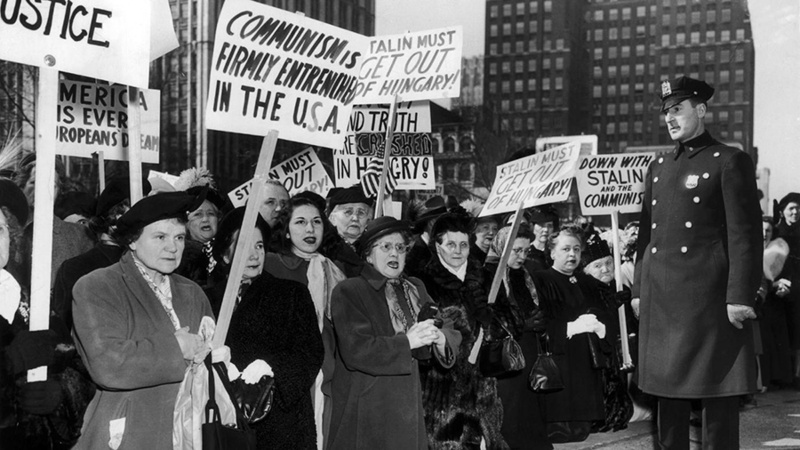 Most of the fears expressed during the Red Scare were of Communist infiltration damaging America internally. Perhaps the greatest international expression of these fears came with the Korean Conflict. The Korean Peninsula had been part of the Empire of Japan but with the conclusion of WWII was divided into a Western-supported South and a Soviet-supported North. Support of the South was seen as a necessary step to prevent the spread of International Communism, but in June 1950, 75,000 Communist soldiers "poured" south across the 38th Parallel. The US, with support from the United Nations, answered by sending in troops hoping to keep the war from expanding into a Third World War. Nearly 5 million lives were lost in the War which ended after two years of negotiation with an armistice (not a declaration of peace, technically the war continues today) signed in July 1953. Tensions remain high between the two Koreas, with the South becoming a technological and economic powerhouse while secretive North remains a potent military threat. The Red Scare Era could be seen to last until the fall of the Soviet Union in 1991. Although fear is a dominant theme of the period, standing up to (real and imagined) Communist aggression may have been one of America's finest moments. One indisputable positive result was the Space Race. Touched off by the surprising news of the launch of the Soviet Sputnik 1, the first artificial satellite, the Race culminated in the Moon Landing by the crew of Apollo 11 in 1969. Although the exploration of Space has fallen by the wayside in the succeeding decades, the technology drive which powered the Race has resulted in the electronics and communications revolution which drive our modern world. Be the first to comment on "Red Scare in Old Time Radio"